Billions of years ago when the Red Planet was young, it appears to have had a thick atmosphere that was warm enough to support oceans of liquid water, and perhaps even life. Thanks to past and ongoing research conducted by the Spirit, Opportunity and Curiosity rovers, NASA scientists are certain that Mars once boasted conditions that would have supported life. To dramatize these discoveries, NASA’s Goddard Space Flight Center has created a video representation of what the environment might have looked like billions of years ago. The artist’s concept opens with Mars appearing as a warm, wet place, and then transitioning to the climate that we know today. As the atmosphere gradually disappears, it changes from the Earthlike blue to the dusty pink and tan hues of Mars today. The animation shows how the surface of Mars might have appeared during this ancient clement period, beginning with a flyover of a Martian lake. 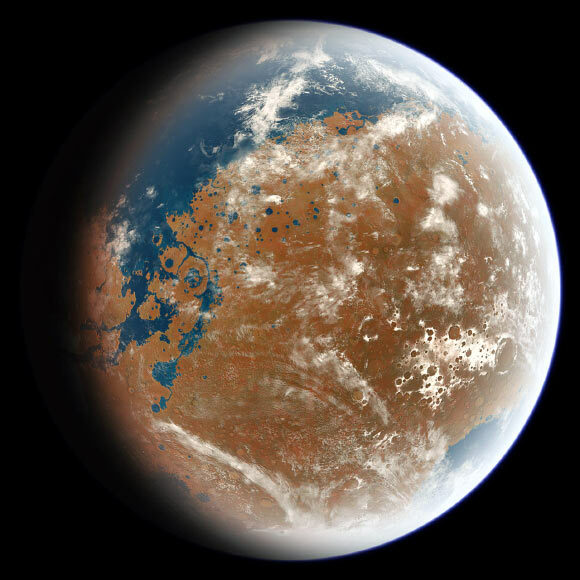 The artist’s concept is based on evidence that Mars was once very different. Rapidly moving clouds suggest the passage of time, and the shift from a warm and wet to a cold and dry climate is shown as the animation progresses. By the end, Mars has transformed to the acrid environment of 2013 – all “dusty pink and tan hues”. One day, NASA believes it may be possible to bring the environment back from this fate. Though its a mere theory at this point, terraforming could transform Mars back into a warm, wet, and life-sustaining planet once more. Enjoy the clip! News From Space: Luna Rings and Spidersuits!